Sometimes, it is unreasonably hard to keep up, for no particularly good reason. 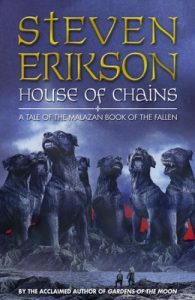 The upshot of all the happenings in my life (and various irrelevancies that also slowed me down, mind you; I’d never claim after being more than a week late that it was exclusively the fault of how busy I am) is that I have far less to say about Erikson’s fourth tale of the Malazan Book of the Fallen, House of Chains, than I feel like I ought to have. Four books is a long way into a series to feel like one finally has a handle on what’s going on, it’s true. I can completely see why it would put people off. And it’s not like I can explain the first book well enough to talk people into reading it, so far. What I do know is this: despite consistent four-digit page counts and a real struggle to figure out what’s up, these are the only new books in the past several years that have made me want to drag them out and avidly reread them, despite a hip deep to-read pile. (As opposed to, say, the Martin series, which I feel like I should reread to know what’s up, but the task fills me with dread.) Mind you, I won’t be doing so for some months yet, but my point is, I resent that I don’t have time to. This entry was posted in Words and tagged epic fantasy, finally know what's up, four-digit page counts, sequel, Steven Erikson, terrible cover, The Malazan Book of the Fallen on July 8, 2005 by Chris.